A 1914 Waterloo Boy Tractor from Rochester, Minn., is featured at the John Deere Tractor & Engine Museum in Waterloo. The original check for $2.1 million John Deere used to complete the $2.25 purchase of the Waterloo Gasoline Engine Company in 1918. The exterior of the John Deere Tractor Museum in Waterloo. Brian Buss with Nagle Signs finishes a display at the John Deere Tractor & Engine Museum, which opened Tuesday in Waterloo. A 1928 John Deere GP tractor is featured in the John Deere Tractor & Engine Museum. A Froelich Traction Engine from the late 1800's on display in the John Deere Tractor & Engine Museum in Waterloo. A display at the John Deere Tractor & Engine Museum. WATERLOO | Step inside the John Deere Tractor & Engine Museum and look upon a simple wooden walking plow that built an empire. The plow is an exact replica of John Deere’s own 1837-vintage plow, which his company commissioned to be built to mark its 85th anniversary in 1922. The plow is one of the first artifacts from the tractor manufacturer’s history visitors will see when they enter the new museum, at 500 Westfield Ave., when it opens today for the first time. 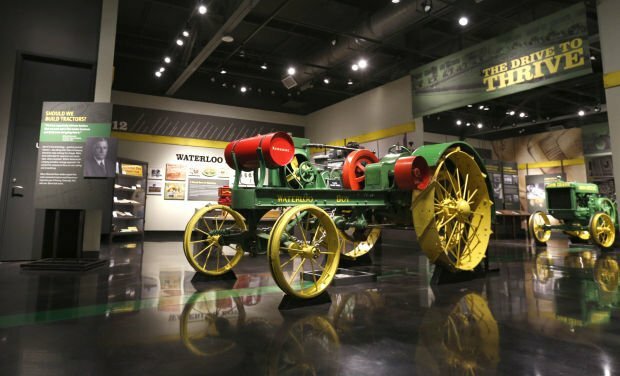 The museum is a two- and three-dimensional tribute to the nearly century-long marriage of Deere and Waterloo, home to the company's largest manufacturing complex worldwide. The history of that partnership is the essence of the museum tour. Both of the museum's curators -- Joshua Waddle and Rosa Grant -- were brought in as much for their expertise in building and running a museum as for their reverence for Deere. “It’s fun to walk Waterloo folks through here, because they come in thinking they know John Deere and their city, and they walk out with a new perspective,” said Waddle, who earned bachelor's and master's degrees in history at the University of Northern Iowa. Waddle and Grant have been involved in the project since May 2011. Many visitors may not know, for instance, that Deere’s entry into Waterloo in 1918 caused apprehension among many in the community, Waddle said. That’s because the Waterloo Gasoline Traction Engine Co. employed about 1,000 of the city’s 35,000 residents, he said. “They really fashioned themselves as being Chicago, an industrial city in the middle of the Heartland,” Waddle said. “Many of them were worried about what might happen,” that they might lose their jobs with the change. The fears didn’t last long. Deere quickly poured millions of dollars into building a modern factory complex on Westfield Avenue in downtown Waterloo. Blueprints of the plan are displayed on a wall in a room dedicated to the original factory site. Visitors also will encounter stories of other key people who guided Deere through its early years in Waterloo as the company led the steady mechanization of farming. One person they will meet is industrial designer Henry Dreyfuss, who designed Deere’s Model A and Model B tractors. “He took things that already existed and improved on them,” Waddle said of Dreyfuss, who also designed the Polaroid Land Camera, the Honeywell circular wall thermostat and Princess telephone and numerous other consumer products. The museum features examples of a number of his original designs. Tractors are perhaps the most notable artifacts on display, but visitors also will find rooms dedicated to all facets of product and part design, from a drafting manual and slide rule to raw components. The trail through the museum -- appropriately, a long green line -- begins with the earliest Deere machines and culminates with its largest -- a 2014 Model 7290 R built in Waterloo for export. It dwarfs a comparable export-bound Model B from 1951, which rests beside it. “That’s the biggest tractor we could get in here, but we wanted to show the contrast,” Waddle said. There is a room devoted to dealers, as well, with memorabilia from several, including the Pulaski, Ind.-based J.P. Pulaski Co., which has been selling Deere products for 120 years. The museum has been more than seven years in the making. Planners have been careful to emphasize the marriage of Waterloo and Deere. They said the symbiotic partnership between company and city are the foundation of every exhibit. In other words, everybody, she said. It’s also about people, as visitors will quickly note when they encounter an abundance of fully restored vintage tractors on loan from collectors across the Midwest, including Waterloo. Chris Boyens, brand standards manager with Deere and considered an expert on the company, has been involved in the museum project since 2007. “My role has been more in help with directions, to help direct the story from a historically accurate perspective,” he said. It’s been a long process, but visitors will find the work that went into it was worth it, Boyens said. Dawn Hendershot, whose family has been working at Deere for six generations, has directed the museum project and will manage the facility. “To me, our team has been working very hard at delivering what we think is a very high-quality museum that is going to be celebratory for the community and the company,” she said. “We’ve worked very hard at it, and it’s going to meet expectations. Correction (12/2/14): The museum's street address was added to the article. The John Deere Tractor & Engine Museum will be open from 10 a.m. to 6 p.m. Tuesdays through Saturdays. Admission is $8 for adults ages 13-61 and $4 for seniors, active-duty military, John Deere employees and retirees. Children ages 12 and under accompanied by an adult can get in at no charge. For more information about tours and the museum, email WaterlooTractor&EngineMuseum@JohnDeere.com or call 292-6126. Too see video and more photos, go to wcfcourier.com. Waterloo Gasoline Traction Engine Co.